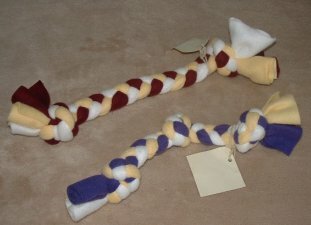 We have been making our own dog and cat toys for several years. They are very popular items at the farmers' market and craft fairs, and make great gifts for your furry friends. We decided it was time to share these wonderful toys with you. Please remember that these toys are for interactive play. Supervision is always required as the toy may pose a risk if ingested. A sturdy toy made of 100% polyester fleece. These tugs measure 12 to 14 inches long and stand up to some serious play. They are a washable, safe alternative to traditional rope tug toys. Colors vary. Please let us choose the color. 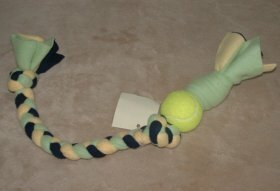 We've created even more doggie fun by adding a tennis ball to our standard fleece tug. This toy keeps our four legged friends busy for hours! Tugs measure approx 20 inches long. Need a gift for a doggie friend? 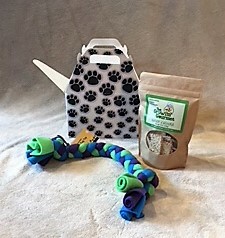 Our paw print gift boxes include a 6oz bag of our scrumptious biscuits and either a tennis ball tug toy or standard tug. Biscuit flavors include peanut butter, sharp cheddar, Maine blueberry or Apple Crisp. 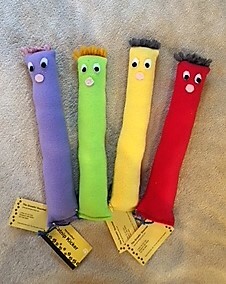 Tug toys vary in color. Please let us choose the color. We couldn't ignore our feline friends. If your cat likes catnip this toy will drive him or her wild. 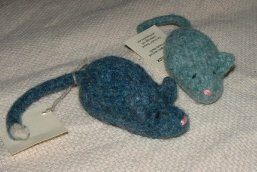 It is knit from Maine wool, felted and stuffed with some pretty potent catnip. These toys turn our 16 year old cat into a kitten again! Mouse measures approx 6 inches from nose to end of tail. Colors vary. Please let us choose. Kickers are a great interactive toy for cats and kittens. Kickers measure 12 inches. They contain some of the best organic catnip! 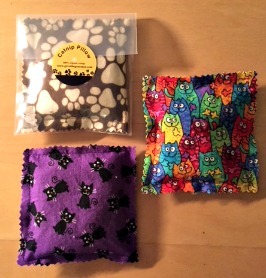 Stuffed with only 100% organic catnip and available in 3 fun designs. Your cat will LOVE these!